Potato gnocchi is one of the easiest pastas to make at home, and the flavor and texture of handmade pasta can't be replicated by the store. 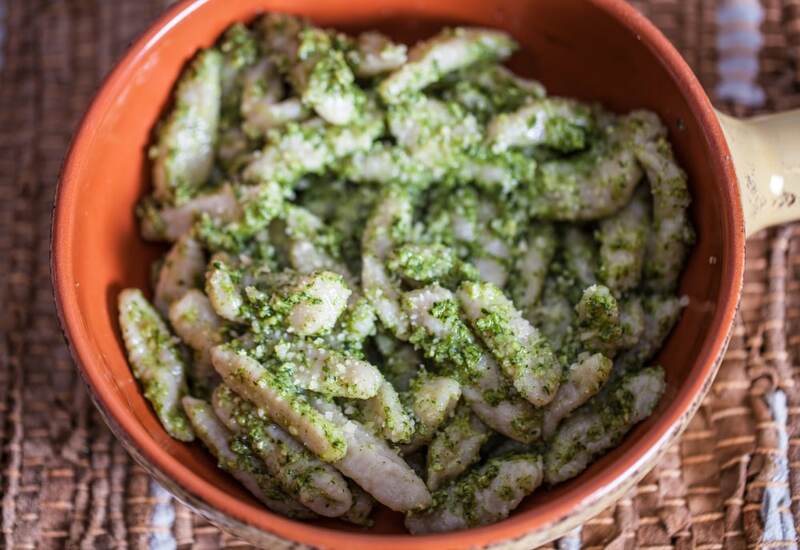 Impress your family and friends with this delicious recipe, featuring fresh gnocchi coated in a vibrant, simple arugula pesto. Pre-cooking the arugula mellows the flavor and removes water from the pesto so it will coat the pasta well. The potato helps bind the pasta dough together, and gnocchi is hard to mess up. Whether you use a fork to create ridges or leave as small dumplings, the gnocchi are a comforting, wonderful dish to add to your repertoire—no pasta maker needed. Always look for ways to maximize your time! You can make multiple batches of pesto and keep them in the freezer for up to 3 months. The gnocchi can also be made ahead of time. Spread the finished dumplings on a parchment paper-lined baking sheet and freeze. Once completely frozen, transfer to a covered container and freeze until ready to cook. Per Serving: 788 calories; 29g fat; 110.2g carbohydrates; 22g protein; 131mg cholesterol; 2457mg sodium. Delicious gnocchi that has a kick to it with the pesto. We added cut up, grilled chicken breast to ours. This was a really excellent dish. It's a great Sunday dinner dish. The gnocchi was delicious and perfect in texture. I also really liked the arugula pesto, it's a nice alternative to pesto. Don’t like gnocchi so swapped that out and used pasta instead. I’m pesto obsessed right now so this recipe was perfect.